It is no secret that I am obsessed with caravans, I find Caravans fascinating and it has been my experience that I am not alone in this. They contain memories, dreams and lives. For me they represent escape and adventure, the nomadic dream. For others it’s nostalgia, maybe fond memories of summer holidays at the seaside - of folding chairs, thongs and mozzies - maybe family holidays roaming the interior, red dust and the road less travelled. Yet still for others they can represent a dwelling, either permanent or temporary. They are simultaneously a home, or a home away from home, stationary or mobile. They have a duality that’s quite compelling and I am fascinated with the memories and stories of nostalgia assigned to these objects. And they have the uncanny ability to create a powerful connection between the viewer and the art and it is this connection that I am most interested in. My research continues…. Caravan Planet is a facebook page set up by Clare and is dedicated to all things 'caravan'. It's a page for all to share their stories and for Clare to share artworks which centre around the theme of, you guessed it, the Caravan! Check it out! Clare Urquhart’s two-metre high installation, a cardboard hill covered in miniature replica retro caravans, is entitled, ‘Heading for the hills (the last resort)’. Clare sold houses for 10 years before finally following her dreams and doing fine arts at TAFE and visual arts at SCU. 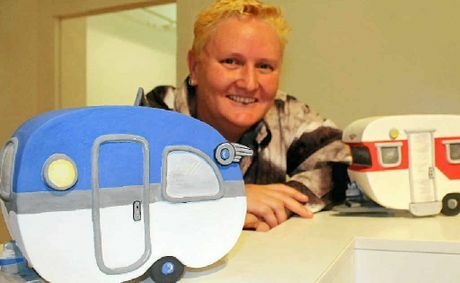 Her series of colourful and fun ceramic models of vintage caravans were exhibited at the Northern Rivers Community Gallery in Ballina (most have since been purchased) earlier this year. One of them, ‘Gypsie Rover and the Table of Knowledge’, took out first prize in the Northern Rivers Social Development Council Art Prize. 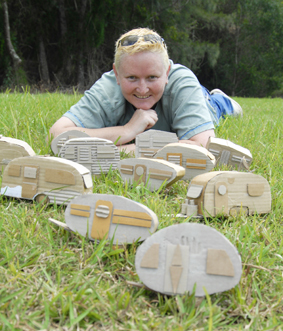 Her work also features in the current issue of Caravanning Australia magazine. “The caravans evoke a sense of nostalgia among people. Their reaction to my work is great. I love the stories they’d tell me about their caravans and their trips,” Clare said.